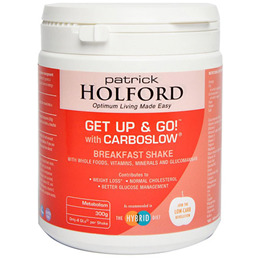 Get up and Go is a delicious low GL breakfast shake powder which can be used to make a healthy shake/smoothie, giving your day the perfect start. It provides 100% RDA or more of a wide range of vitamins and minerals, (including almost 1000mg vitamin C per serving), one third of your daily protein requirements, and relevant levels of essential fats. Get Up and Go is made from the best-quality whole foods, ground into a powder. The carbohydrate comes principally from apple powder, the protein from quinoa, soya and rice flour, the essential fats from ground sesame, sunflower and pumpkin seeds, the fibre from oat bran, rice bran, and psyllium husks; and additional flavour from almond meal, cinnamon and natural vanilla. Only 3 GLs per serving. Soy isolate (non-GMO), apple powder, xylitol, vitamin and mineral premix (containing di-calcium phosphate, magnesium oxide, vitamin E acetate, niacin [vitamin B3 as nicotinamide], pantothenic acid [as calcium panthothenate], zinc gluconate,, iron gluconate, vitamin B6 [as pyridoxine hydrochloride], thiamine [as thiamine hydrochloride], riboflavin, manganese gluconate, vitamin A [as acetate with dl-alpha tocopherol, corn oil, corn starch, acacia gum and sucrose], folic acid, copper,, biotin, potassium iodide, selenomethionine, chromium picolinate, vitamin K, vitamin D2 and vitamin B12 [as cyanocobalamine]), maltodextrin, ground almonds, quinoa, lecithin powder,, vanilla flavour, vitamin C (as ascorbic acid), rice flour, psyllium husks powder, oat bran, citric acid, sunflower seeds, sesame seeds, pumpkin seeds, and cinnamon bark powder. For children 18 months - 5 years - 2 heaped teaspoons (10g). From 10 years old/adults - 6 heaped teaspoons (30g) daily. Blend with half a pint of milk, soya milk or rice milk, a handful of berries such as strawberries, raspberries or blueberries, or half a banana. Provides approximately 8 GLs per adult shake. Below are reviews of Get Up and Go! Low GL - 300g Powder by bodykind customers. If you have tried this product we'd love to hear what you think so please leave a review. Quite expensive, but I think worth the money. Contains everything you might need to start your day - as recommended by Patrick Holford. Delicious mixed with mixed berries and skimmed milk. The best breakfast out there. Everything you need for a healthy breakfast, including 1000mg Vitamin C; lasts for a year if not used. I have found the powder to be consistent in its composition; no clumping and not much variation in the size of granule. Recommended by Patrick Holford as the only breakfast you might need (from a man that recommends nutritional diversity, that's good enough for me.) If you haven't come across Holford yet, read his books and get on his website; you won't regret it. Five star breakfast. 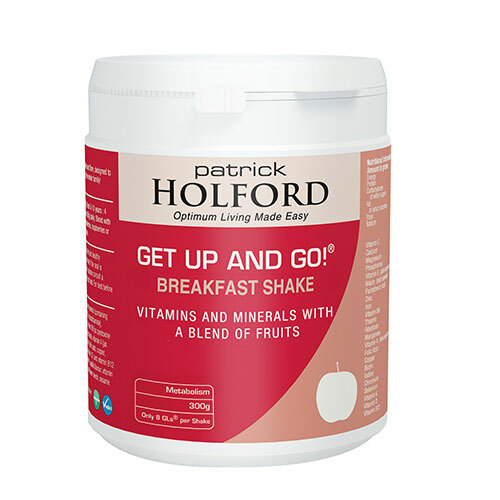 Get up and Go is a delicious low GL breakfast shake powder which can be used to make a healthy shake or smoothie, giving your day the perfect start.